Before Mike started work, we tried to get around to see some stuff. So we made it to a few fun places. We went to the tech museum downtown. It has all sorts of nerdy stuff, like creating a microchip and then programming it, and then having a robot draw a self portrait of you. 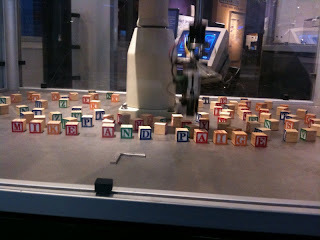 They also had these robots that would spell out a message in blocks. Whatever you told them to write, they would find the block and do it. This is what Mike was doing while I was in the bathroom. Then, we had to go to another baseball game. 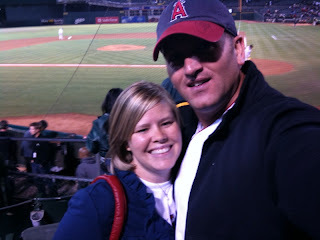 Again, the Angels were playing the A's in Oakland, so we went dressed in our Angels gear and sat on the 4th row behind the A's dugout. Dangerous territory, but the Angels won, so it was all worth it. We also got to see some of our favorite players from the Bees that got picked up by the Angels recently. I almost felt like I was home for a minute. Most recently we went to Carmel. Yesterday in fact. The whole name of the town is Carmel by the Sea, CA. If that tells you anything. It is right by the water, and the downtown was so fun. We went with the intention of going to the art festival, but instead we just explored main street and did a little shopping and lunch. We ate at a delicious restaurant, and then stopped by a little shop called "The White Rabbit." The entire store is based around Alice in Wonderland. The owner even had an original copy of "Through the Looking Glass" that was valued at around $400. Anyway, we decided that we are going to use our Saturdays to explore this area. 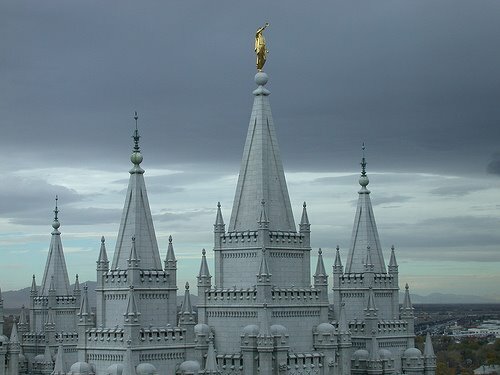 It is so pretty. Visitors are always welcome. Hope to see you soon.